Given the presence of speeds like Apache Warrior (#1) and John Eddie (#13), who will break from opposite ends of the starting gate, it’s no surprise that the Pace Projector is predicting a fast pace. We’re hoping that these and others ensure an honest early clip because we’re primarily interested in late runners. Nicholson (#7) has run just fine in each of his last two starts, both at this level, earning speed figures in the mid- to high-80s, which stack up well against this field. The only drawback is that he’s just 1-for-20 in his lifetime, but one could argue that he’s had limited opportunities in races where he actually had a legitimate chance to win. Also on our tickets will be Corpie the Cat (#12). This horse has been a disappointing claim for Todd Pletcher and Gary Barber. He was visually impressive in his maiden win, but it appeared that he was beating a very weak field that day, and he just has not moved forward from that effort. That said, he’s been running in tougher spots lately, and this will be his first start sprinting on dirt since that winning debut, which is why we’re giving him a look here. Elcinico (#2) has a similar profile to Nicholson. He’s recently found a home as a late-running sprinter in these bottom-level conditioned claimers. This seven-pound apprentice rode him well last time and a similar performance could very well land him a spot in the trifecta again. Our top selection is NORM THE GIANT (#4). We were interested in this horse last time, but were very wary of his rider, who has had little success on this circuit. Unfortunately, the horse actually showed up with a decent effort, but his ridiculous trip was impossible to overcome. After getting badly steadied out at the start, he was rushed up to regain contact with the field while racing extremely wide. 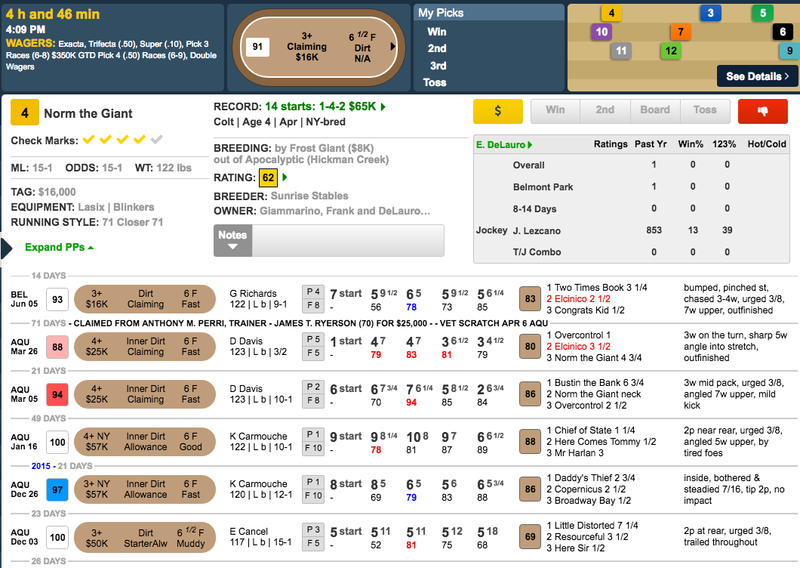 This horse had previously been hindered by biases in his two starts in March and is in much better form than it appears. We love the rider switch to Jose Lezcano and have to give him another chance.